Tween Jessica "Jesse" Malloy is the only daughter of Hollywood publicist Gabriel Malloy. Gabriel is the man in charge of promoting a relatively unknown Swedish cinematic beauty named Ingrid Bergman. As a Hollywood daughter, Jesse carpools to school with the children of other celebrities, soon getting acquainted with the somewhat reclusive Ingrid Bergman. As years pass by and Bergman’s fame grows, Jesse comes to idolize her, but Bergman’s fall from grace with the American public in 1950—when she falls in love with Italian film director Roberto Rossellini—causes Jesse to question her hero, and the religious faith she has been brought in. 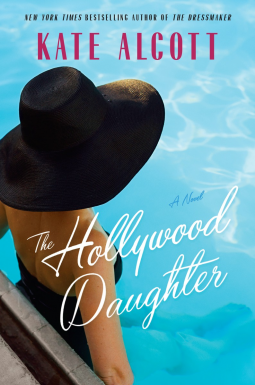 In A Touch of Stardust, Kate Alcott conjured movie magic, but reading The Hollywood Daughter feels like a chore. It is an uninspired family drama played out against the heady times of Hollywood in the 1940s and 1950s. Rather than historical fiction, this is a coming of age story about a girl disappointed by the choices that Ingrid Bergman, her childhood hero, makes in real life. It is a pity that Kate Alcott squandered material that could have made for a juicy and entertaining novel a-la A Touch of Stardust. Instead, there is lots of name dropping and a story and characters that don't ring true. Okay. So I won't add this one to my TBR list! I hate it when that happens. An author who disappoints me after having liked one of her earlier books. I know, but all can't be winners. What a shame. How disappointing for you. It had potential, but became too sentimental for my taste and didn't work in the end. If it had been exclusively about Ingrid Bergman, perhaps it would have been gold.